Many Omaha residents are under the impression that glass cannot be recycled in the city. While it's true that you can't put glass in your green bins, you can sort the glass separately and take it to one of the many drop off sites around the city. In order to expand the accessibility and convenience of glass recycling, Keep Omaha Beautiful assisted the City of Omaha in securing three new locations for glass recycling. 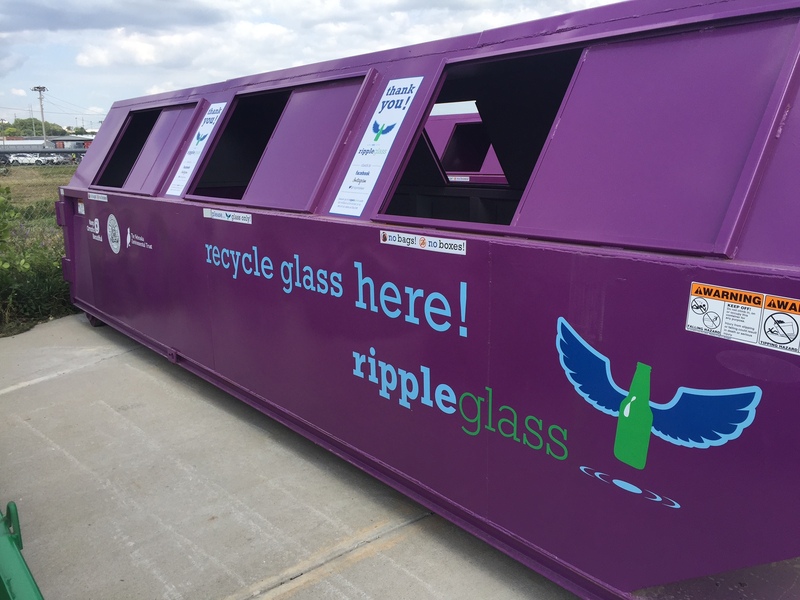 Hy-Vee (180th and Pacific), Fresh Thyme (150th and Maple), and Baker's at Westwood Plaza (120th & Center) now have purple Ripple Glass bins in their parking lot, open 24-hours. Thank you to the Nebraska Environmental Trust and the Nebraska Recycling Council for supporting this initiative! How is the City’s glass recycling program being expanded? Keep Omaha Beautiful received a $14,000 grant from the Nebraska Recycling Council to buy new collection containers for glass to help the City expand the program. The large collection containers are painted bright purple and are located in the parking lots of Hy-Vee at 178th & Pacific and Fresh Thyme at 150th & Maple. A third site in Southwest Omaha will be announced in the near future. In total, there are now 9 different drop-off sites located throughout the City where people can drop off glass for recycling. Previously, the City did not have any containers located in west Omaha (other than Elkhorn), which is why these two new sites were selected. Why can’t glass be placed in the green bins with other recyclables as part of the City’s curbside recycling program? When glass is placed in a recycling compacter truck, it breaks and unfortunately contaminates other valuable recyclables, such as paper and cardboard. Consequently, it needs to be collected separately in order to be recycled. What type of glass can be recycled? The labels do not need to be removed. However, people are encouraged to remove the caps and quickly rinse out the items. Any bags, boxes, or bins that are used to transport the glass should not be placed in the purple collection containers. Items that are NOT accepted: no dishware, pyrex, corning ware, mirrors, light bulbs, or ceramics.